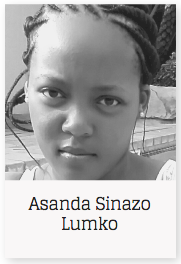 My name is Asanda. I am a responsible, consistent, hardworking and friendly individual with a strong passion for teaching. I am a people person; I pride myself on my listening and communication skills, and I’m always happy to make a joke. I love working closely with children and seeing them happy in the process. Upon completion of my Post-Graduate Certificate in Education, I will give back to the community back home by becoming a teacher and encouraging children to attend school regardless of their situation. I will be a part of the generation that will improve the quality of education in the Eastern Cape. Above all else, I want to be a motivating factor to people who have lost hope because of their circumstances. As a teacher, I hope to provide skills and knowledge that learners use throughout their lives. My aim is to become a positive role model to them. I hope to cultivate open minds, knowledge and ability to look at the world critically. My vision is a world where all students believe in themselves and in their capacity to make positive change.